This is the time of year when wellness gets hard for me. No, I’m not talking about eating too much over the holidays (though I inevitably develop a sugar habit by the end of December). It’s more of an overall effect of colder weather turning me more sedentary and turning my appetite to crap. I swear every February it all comes to roost and I feel puffy, bloated, dry and blemished. Besides running Pyragraph, my main gig is writing and editing. I sit in a chair, or on a couch, in front of a laptop, a lot. Being self-employed and a mom to boot, it’s really easy for work and parenting to fill in every little space of life, crowding out exercise and healthy eating. I also play music, and when music and exercise compete for my precious spare time, guess what? Music usually wins out. So this year I’m going to use this opportunity to consciously try to avoid the February bloat, starting now. 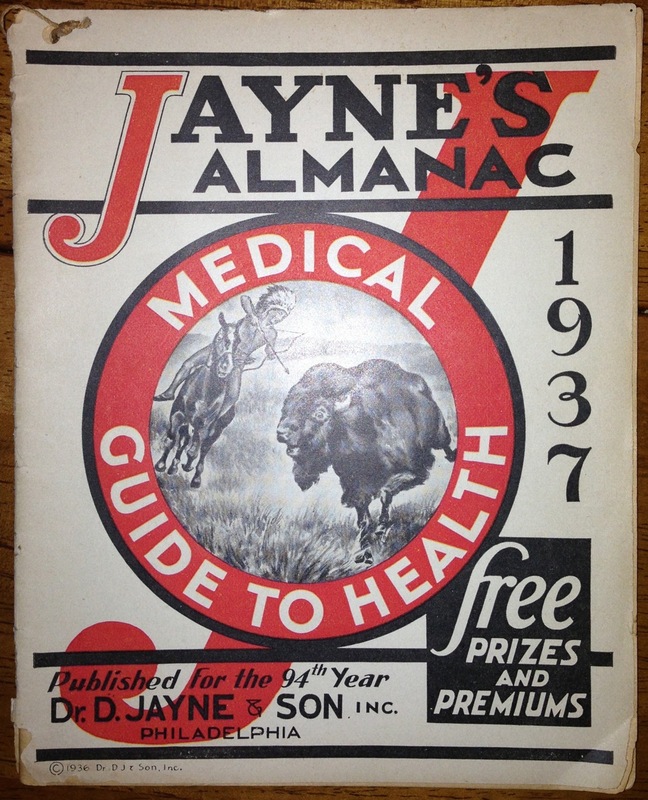 I tend to find articles about diet and exercise incredibly boring, so to make this more interesting I thought I’d offer my wellness tips along with some advice I found in Jayne’s Almanac: Medical Guide to Health, from 1937. Just looking at that dire rainstorm gives me a tickle in the chest. 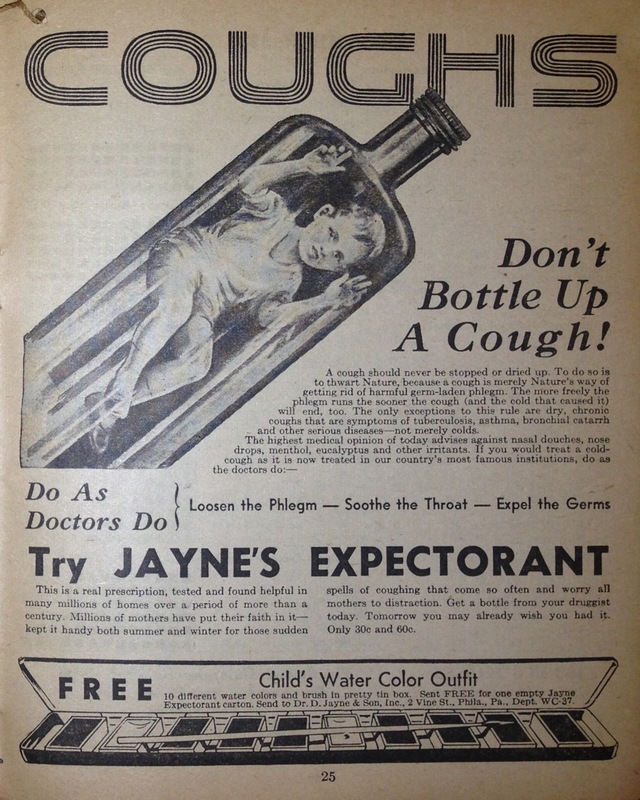 I’m not terribly prone to coughs, but every now and then I have suffered the misery of the nighttime cough which is truly evil. Saltwater gargles to clear the crud out of my throat helps, as does using a neti pot before bed. Remember to use distilled water for your neti pot, never tap water! Bacteria and protozoa in tap water can cause injury or death when introduced to your nasal passages. It’s rare but it has happened; two people died in 2011 from amoebic brain infections linked to neti pots. Shudder. Nerve pain can be triggered by the littlest, weirdest stuff. Carrying even a small shoulder purse for more than 15 minutes or so can set off my neck. Cold weather makes my body just a little more tense overall which makes it more susceptible to trigger a neck episode. Pinpointing your triggers is step one in getting past the problem. Don’t just stretch the problem area, focus also on the adjacent areas. A physical therapist helped me understand my thoracic spine (the part right below the cervical spine) was stiff, which put a burden on my cervical spine to take up the slack. Focusing on building flexibility in my thoracic spine was HUGE in fixing my problem. Take the drugs when you need to. For whatever reason I’m not into pills and never even bothered to fill the prescriptions for pain meds that my doctors gave me in the early years of this neck issue. Part of it was that the prescriptions to me felt like the doctors were blowing me off and not trying hard enough to figure out why I was having pain, which was more important to me than masking it with meds. 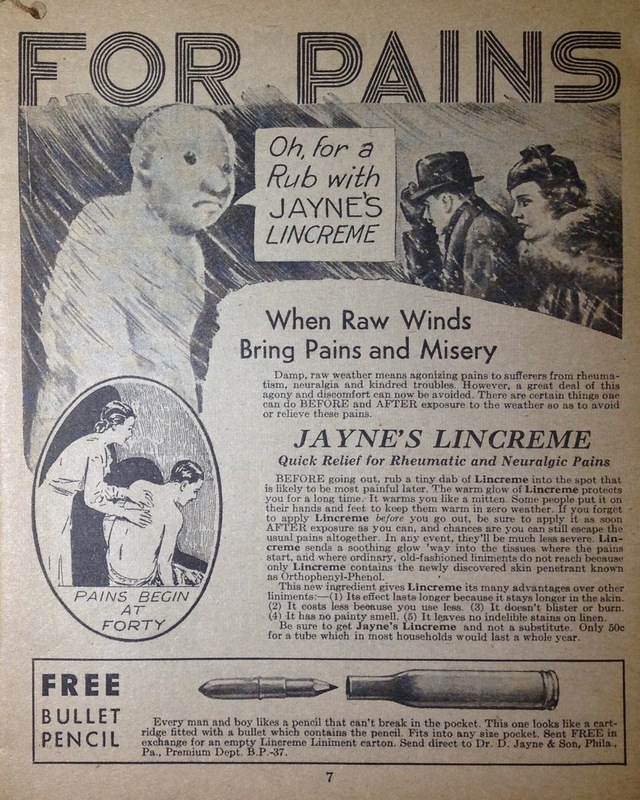 But one year on a road trip I took the muscle relaxers and painkillers (Flexeril and Percoset) which helped the trip not be ruined — and I realized if I took the meds at the first sign of a twinge in my neck, the weeks-long ordeal could be avoided altogether. I’ve never looked back. Flexeril is my friend. I’ve never suffered from anemia but man, have I learned a lot about various blood cells from my daughter’s experience with aplastic anemia. Red blood cells are the oxygen-carrying cells, so if your red blood cells are low, you’ll fatigue more easily and find yourself gasping for breath even after mild exercise. Nutrients to boost your red blood cell production include iron, copper, folic acid, B vitamins and vitamin A. Some of the best foods to get some or all of the above include lentils, green leafy vegetables (eat your kale people! ), nuts and fruits. For what it’s worth: My daughter has gotten weekly blood tests for the last six months, and I noticed a definite boost in her red blood cell count once her doctors added a folic acid supplement to her medications. We also make sure she eats at least one, preferably two “green things” a day. It’s hard to tell what’s doing what, but it does seem her blood test results are better the more green stuff she eats. Sorry, I have no experience in expelling worms. 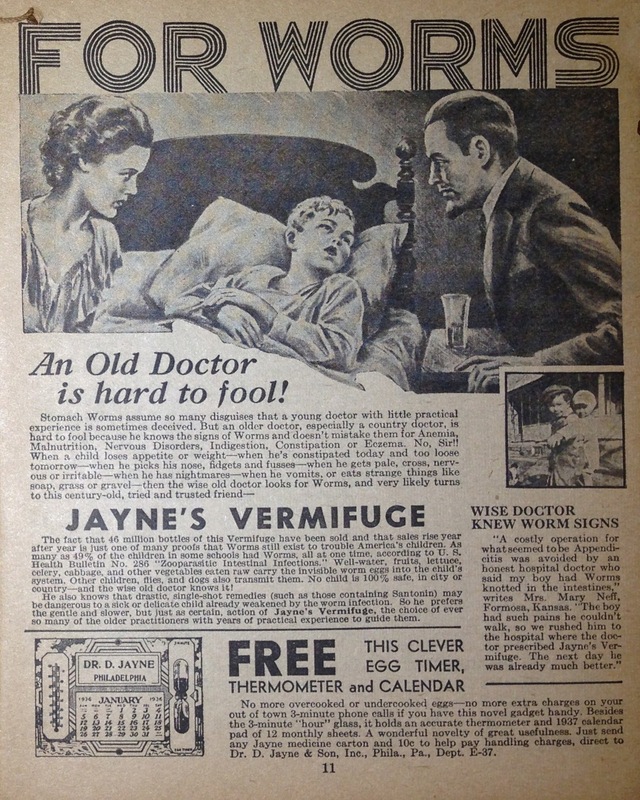 But I’m sure a clever egg timer, thermometer and calendar are of great comfort when your gut has become a wormery. I also avoid wheat which definitely seems to make a difference. I don’t follow a strict gluten-free diet but when I get lazy and eat pizza or bread, I totally notice things slowing down. I’m in a coffee phase now which is OK at the moment, but every few months I switch to green tea and always feel better digestion-wise. 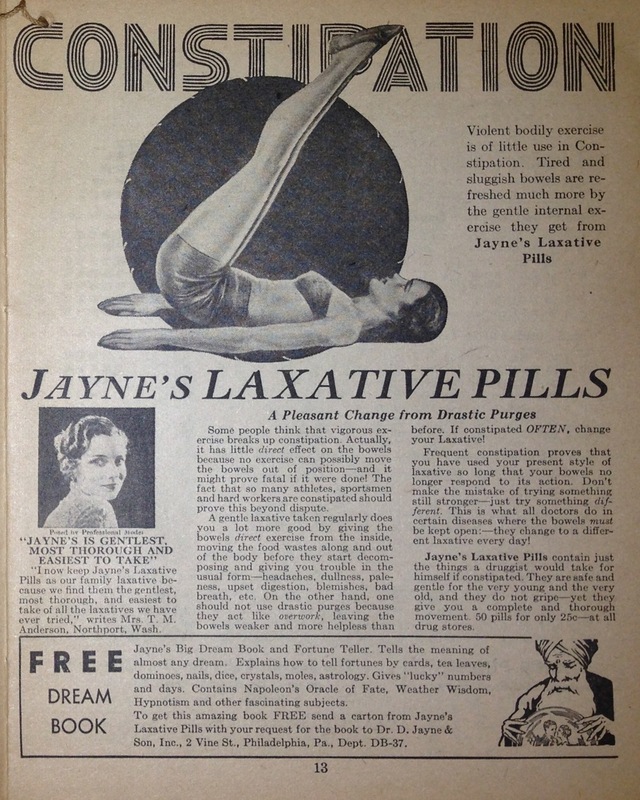 I’ve also heard smoking pot keeps bowels happy. 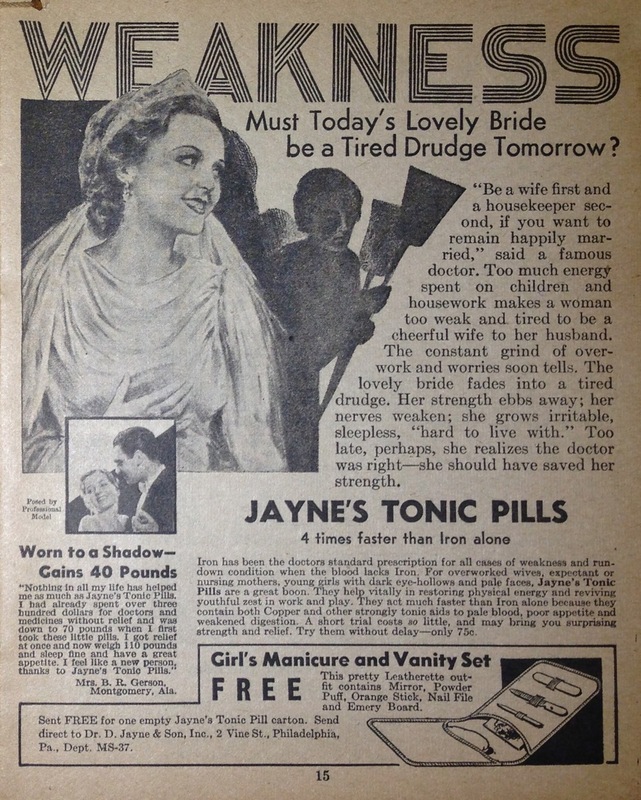 When I start feeling like a tired drudge, it’s almost always because I’m slacking on exercise. For me, a little goes a long way (which is why I always feel so stupid for letting it slack). If I can manage to exercise just 2-3 times a week — either running a couple miles (slow and low is my tempo), or riding my bike to Java Joe’s — I’m good. If I also do my silly weight lifting exercises a couple times a week, I feel like a superstar. I mostly do my own brand of free-form movement exercises with 8-lb. weights, kind of like interpretive hatha Tai Chi with dumbbells. It looks spazzy but it works for me. Blemishes. 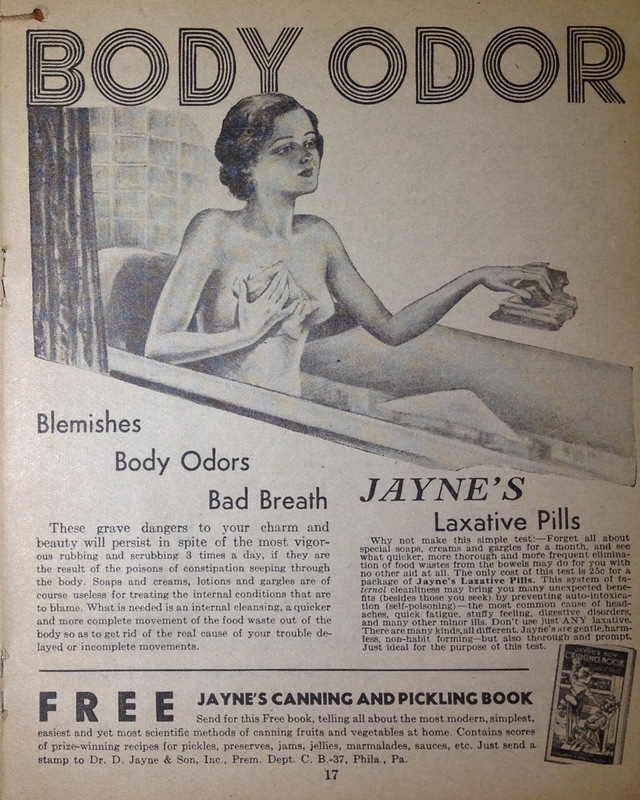 Body odors. Bad breath. Fighting these grave dangers to my charm and beauty takes vigilance and wiles. OK not really. But there are some things that do really help keep me feeling more fresh and less ragged. And let’s face it, after age 40 it’s all too easy to slip into hag territory. Drinking lots of water and avoiding wheat and sugar are probably the biggest thing for me. If I start slacking on any of those, puffiness and bloat set in. Winter is really tough on my skin, so starting in October I need to stay two steps ahead of winter dryness. I tend to break out when my face is dry, not oily, so staying moisturized is essential. I also tend to fail to notice how dry I’m getting until it’s almost too late. Every December and January I realize my face and hands are super parched and it’s almost too late to turn it around. This year already I feel I haven’t been doing a great job of fighting this. So right now let me resolve to do the things that I know help: 1) Drink more water. 2) Put a humidifier in my bedroom. 3) Use nice oil on my face every night; I really like argan oil. 4) Moisturize my hands throughout the day so they’re not red and chapped and beyond help in January. 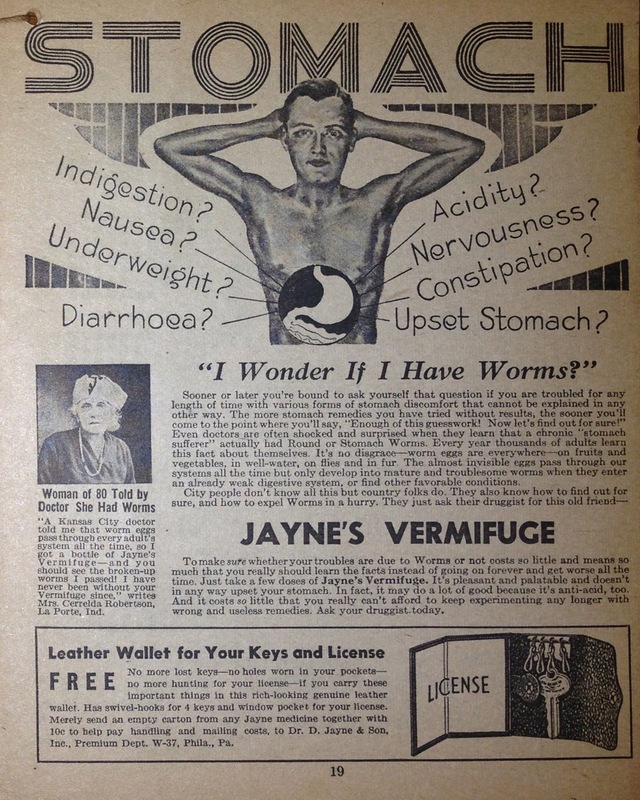 Wow, worms really were a thing in the 1930s, huh? When my stomach feels like crap I find myself thinking “Ugh I shouldn’t have had that second whiskey last night” or “Why did I eat that cheeseburger at 1am?” not “I wonder if I have worms?” Yeesh. One thing I’ve done for years, but have neglected in the last few months, is start the day with my “concoction”: a shot of lemon juice (half a lemon), a pinch of powdered cinnamon and ginger, a big glug of honey and enough hot water to dissolve it all. When taken on an empty stomach first thing in the morning, this is supposed to help detox and stimulate the liver and generally help digestion. When I feel the need to detox, I generally turn to an Ayurvedic diet. Ayurveda is a centuries-old study and practice of nutrition and health in India that focuses on understanding your basic constitution and keeping it in balance. Any health system that touts the detoxifying effects of butter (specifically, ghee) and honey gets my thumbs-up. I have nothing to add beyond my tips above for how to avoid becoming a tired drudge. 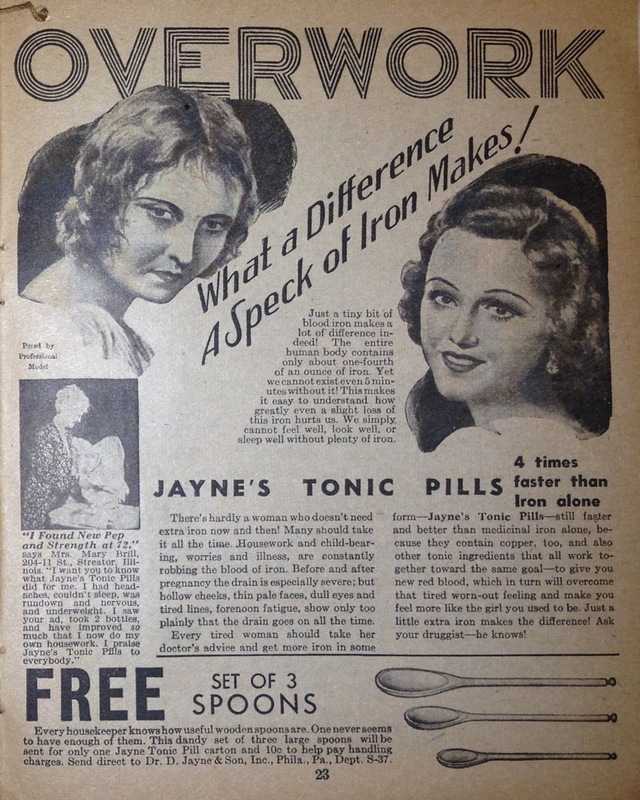 But one thing: Did they really have to put the ad for spoons on the same page as the tired overworked lady? She’s just looking down there thinking “Oh lord what am I going to cook tonight for my seven hungry children?” I feel so sad for her. I really hope she gets that speck of iron. 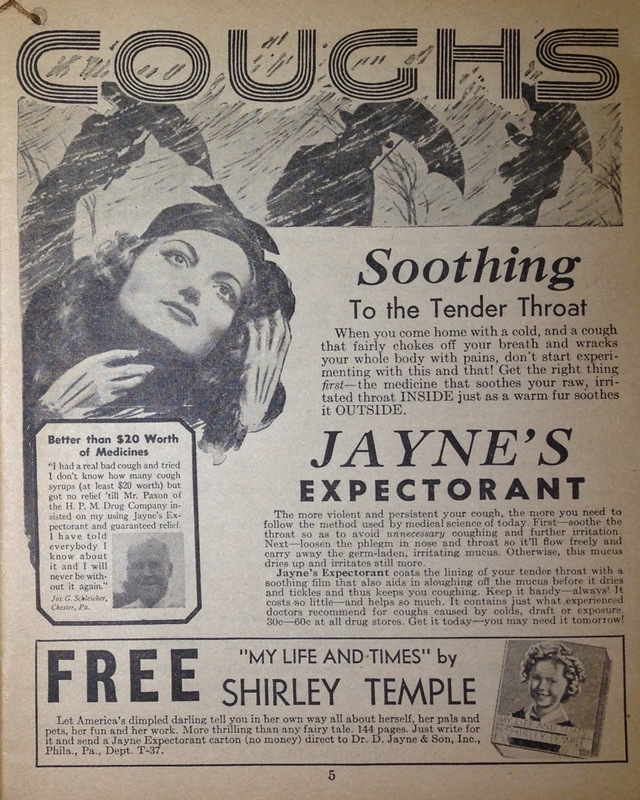 Again, I already gave my tips for a cough above. But I find this image really creepy. OK first thing: If your kid is having trouble sleeping, don’t show him/her this picture. Seriously, what kids dream of knife-wielding pirates? Second: Worms again, really? I must say, I am grateful to live in a largely worm-free generation. 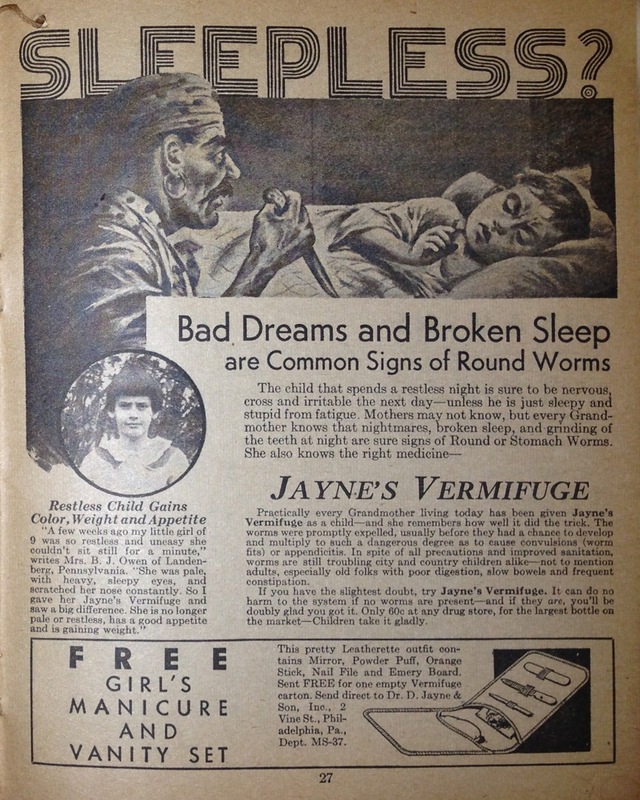 I’m happy I’ve never heard of a child having a convulsive “worm fit” and hope I never do. 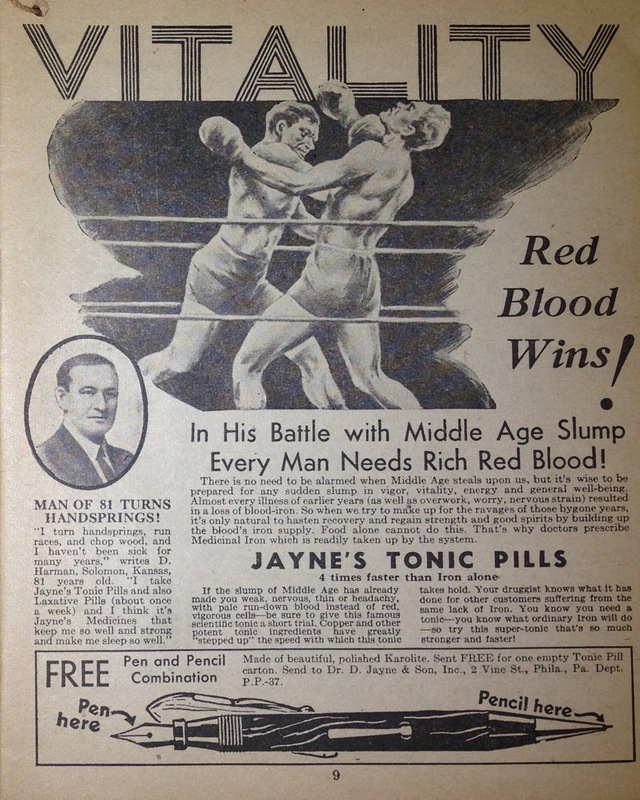 All photos by Peri Pakroo, from Jayne’s Almanac: Medical Guide to Health, 1937. Peri Pakroo is the founder, Publisher and Editor of Pyragraph. 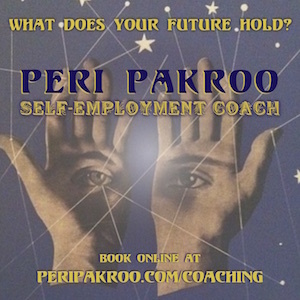 Outside her work with Pyragraph, Peri is a business author and coach, specializing in creative and smart strategies for self-employment and small business. She has started, participated in, and consulted with businesses and nonprofits for more than 20 years. Her focus is on helping people build structure for their passions to find success on their own terms. Her blog is at www.peripakroo.com. 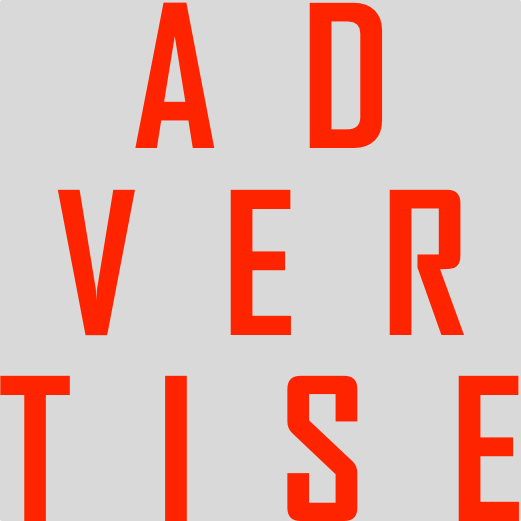 Peri received her law degree from the University of New Mexico School of Law in 1995, and a year later began editing and writing for Nolo, specializing in business and intellectual property issues. She is the author of several top-selling Nolo titles on small business and nonprofit start-ups including The Small Business Start-Up Kit, The Women’s Small Business Start-Up Kit and Starting & Building a Nonprofit. Peri accidentally started her first band The Moist Towelettes at the age of 40 with her husband Turtle O’Toole. Since then she has played in a number of bands including the blurts and her own downer-country project, Peri & the FAQs. In 2012, Peri saw the need for a resource featuring the voices of a wide range of creative workers and the many different career paths they take. She founded Pyragraph to fill this need. Here’s the Pyragraph start-up story.